Apartments in Kiev today are demanded almost as much as a hotels. 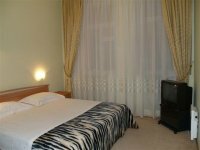 Considering the rising hotel prices, many tourists prefer to stay at comfortable Kiev apartments as an alternative to standard hotel accommodation. Our apartments in Kiev intended to the daily or monthly rent. 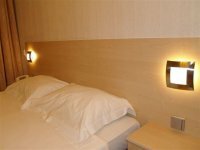 They are vary in living space, but well renovated, equally well equipped with quality furniture and household appliances, provides all facilities for comfortable stay and located in the heart of Kiev. Air-conditioning and complimentary high-speed Internet access in evry our Kiev apartment. Best value for money: from 38 € per day plus discounts for rental of 7 days, the price does not depend on the number of people living in the apartment. At present time we offer 9 apartments which are in our management, so that we can guarantee the best prices and quality. A small but very comfortable and functional apartment for 1 or 3 people. Living room, kitchen, separate bathroom, hallway and balcony. Like all of our apartments, it is well-equipped with audio and video. Located not far from St.Sophia Square and the historic St.Andrew's Descent. Apartment with a large Jacuzzi whirlpool bath tube, located near the central Kiev square Maidan and St.Michael's Monastery. A quiet location overlooking the beautiful old park. On the first floor of this building are the hotel Gintama and non-stop mini-market. Very quiet and bright apartment is in a respectable district in proximity close to the National Opera and Ballet of Ukraine. Two blocks down to Kreschyatyk Str. Very convenient and ecological apartment with oak parquet and quality wooden window frames. Located in a quiet street near the Golden Gates. In this same building, around the corner, there is a cozy restaurant Pantagruel. Apartment with large living room anda cozy bedroom, situated in a quiet area of diplomatic missions, close to St. Sophia Square and to the St.Andrew's descent. Nearby are Hyatt and Radisson hotels with a very good but quite expensive restaurants. This large apartment has two separate rooms - a bedroom and a bedroom-living room, where you will find two double beds, double-sleeping sofa-bed and two chair-beds. Locsted close to the Golden Gates and to Kreschyatyk Str.
. Very colorful design work in Hi-Tech style with the presence of Japanese motifs. 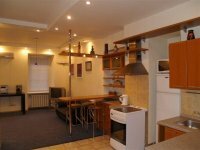 Located in a nice area opposite the Palace of Sports, five minutes walking to Kreschyatyk Str. In the same building there is a great Ukrainian restaurant Varenychna Nr 1. A large and very quiet apartment with stylish design. Very close to Maidan, the central square of Kiev. A large duplex apartment designed in Art Nouveau style and presence of Japanese motifs. Located in a beautiful area next to Leo Tolstoy Sq. and Downtown. Just opposite the building entrance there is one of the finest restaurants of Ukrauniian cuisine, stylized to the end of XIX century interiors and good prices.